Attempt to assassinate the Emperor while disguised as the Gourmet. Enter the castle using the Gourmet's letter. Cook the Gourmet's famous stew and poison it at the end. Escape when the Emperor dies. After securing the writ of passage into the Emperor's service, the rest of the plan is ready to fall into place. Following Astrid's instructions, travel to Solitude with the poisonous herb she gave you and report to head of security, Commander Maro. Show him the writ you stole from the Gourmet to gain entrance to the castle. Maro will allow you to pass with no trouble (commenting on your clothing depending on whether or not you are wearing the chef's hat or clothes), telling you to report to the castle's chef, Gianna. When Gianna greets you, she is both nervous and excited at the prospect of working with the great Gourmet. If you have yet to don your chef's hat, she will direct you to one on the shelf; you cannot begin "cooking" until you are appropriately attired. Once you are ready, Enough! The Gourmet is here to cook, not talk! Let us begin. Gianna flusters, "Oh! Yes, but of course. Ahem. The Emperor has requested your signature dish - the Potage le Magnifique. I've taken the liberty of getting it started. But the cookbook only says so much, and everyone makes the Potage differently. I would be honored if we could make it... the Gourmet's special way. The base broth is already boiled. We can get started right now. So... which ingredient should I add next?" You now have four ingredients to select, at each stage there are three options, the normal, the strange, and her choice. When you are finished don't forget to add your "special" final ingredient: "Oh? What is this, some kind of herb? Are you sure? The Potage tastes perfect as it is. Any other ingredient might..."
Now, now, Gianna. Who's the Gourmet here? "Heh, I'm sorry. Of course. It's your most famous recipe, after all. All right then, your secret ingredient's been added. 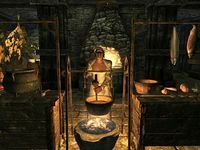 And if I may say so... it has been an honor, getting a chance to prepare a meal with, well... the best chef in the entire Empire. I'll carry the stew pot, and lead the way up to the dining room. I'm sure the Emperor and his guests are dying to meet you." It is not necessary to poison the Emperor with the Jarrin Root, however, in order to successfully complete the quest—you may kill him any way you want. When the Potage is complete, follow Gianna into the dining room as she serves the food to the Emperor. Right before you go in, there is a copy of the Enchanting skill book Catalogue of Weapon Enchantments on the table to your left. 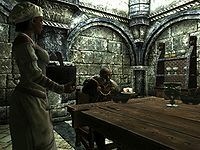 The Emperor will be speaking to the diners and a noblewoman about his cousin's murder when you enter, while two Penitus Oculatus agents stand guard behind him. Gianna will serve the Emperor the meal you cooked and, regardless of the ingredients, he will compliment its amazing taste. If you added the Jarrin Root, the Emperor will soon die a rather unspectacular death. The guards will attack you upon the Emperor's death, and Gianna will attempt to defend you before fleeing, although this may be avoided by successfully sneaking as he dies. If you didn't add the poison, the Emperor and his guests will continue to slurp their soup until you assassinate him. Once the Emperor is dead, exit through the door opposite where you entered upstairs. Once out the door it looks like you are home free. However, as you cross the bridge, you will be ambushed by Commander Maro and several of his agents. He reveals that the man you killed was a decoy. Maro explains that someone from the Dark Brotherhood betrayed you and revealed to Maro your plans to assassinate the Emperor. Maro agreed to allow the Brotherhood to continue its business in exchange for you. He then tells you that because the Dark Brotherhood killed his son he intends to go back on his word and wipe them out. He has sent his agents to attack the sanctuary already. As soon as the conversation with Maro begins, your bounty in Haafingar will be set to 1500, so the city guards will be on the lookout for you. Escape the city by following the tower's stairs to the very bottom and head to the Brotherhood Sanctuary. You cannot fast travel directly to the sanctuary, so the quickest option is to fast travel to Falkreath and head west. The quest ends when you reach the Sanctuary. It's possible to cross the bridge without incurring a bounty. To do this, cast a Destruction spell with a large area of effect (e.g. Fireball) a couple of times in both the upper and lower doors across the bridge, and slowly walk across. You'll be stopped as if Maro was talking, but you'll quickly exit back out, not getting attacked by the Penitus Oculatus or getting the bounty. You can then easily leave. As long as you don't kill the men you won't get a bounty. You will need to leave the city by foot as the guards are scripted to be hostile, which prevents fast-travel. Killing any single Solitude guard undetected may remove the bounty. If you do get a bounty, then, as long as the three Penitus Oculatus men are dead, you can remove the bounty using your Thane status or Thieves Guild association (provided you have them available). You should remove all items you own or want from the sanctuary before completing this quest, or they may be lost. However, the Unusual Gem located in Astrid's room will still be available. Maro will have different dialogue based on your equipment when you arrive. If you are wearing a Chef's Hat or Chef's Tunic, he will say "Your clothes... of course... I should have realized..." Otherwise, he tells you "You are not dressed as I had expected." Regardless, he allows you to pass. If you are in the form of a werewolf or vampire lord while crossing the bridge, you'll automatically change back when Maro appears. After the quest, the Emperor's Tower will still be freely accessible, both from the walkway escape exit and from the front door inside the castle courtyard. However, the door to the dining hall will be permanently locked from both sides. The tower is completely abandoned after this point, so you can take what you want without consequence. Be aware that the whole place respawns, however, so it cannot be safely used as a house. After you tell Gianna to add the jarrin root to the recipe, if you quickly enter your menu you can drop it from your inventory; this allows you to retrieve it later. The quest will continue and the Emperor will still die of poisoning. It is not possible to make the actual Potage, but the recipe does exist in the game; if you were allowed to, the correct ingredients to add to the broth would be butter, flour, carrots, and onions, followed by the "special ingredient". Of these, only the carrots can actually be added. This quest may not start on completion of Recipe for Disaster. Setting the stage through console does not work, as the stage always remains 0. The cause of the bug is currently unknown, and the easiest way to overcome it is to skip the quest entirely. To do this, move to a location away from the Dark Brotherhood Sanctuary, and use the console commands completequest db09 followed by setstage db10 10. This immediately starts you on the following quest. The guards who arrive with Commander Maro may either remain there if you snuck past without killing them, or respawn if you did kill them. They stand still and scowl at you, and will never attack, though they do appear as red dots on the compass if you come near the sky bridge and prevent fast travel like any other enemy. You can kill them without incurring any additional bounties, and they will not fight back. If you have an aggressive follower with you, your follower may attack them; they still will not fight back. Their reference numbers are 643D4, 643D5 and 643D6. The problem can be fixed on the PC by entering the console (press "~") and typing prid 643D4 followed by disable, and then repeating for the other two numbers. Looting the Emperor's dead body seems to cause a glitch where the world incorrectly loads and you travel on the land under the buildings' foundations, causing the quest to become stuck on "Escape from the tower". To fix this, load from the previous autosave before cooking the Emperor's last meal, and do not loot the Emperor's dead body. If you have a follower, you can ask them to stand in the way of the conversation between you and the cook; they may interrupt your conversation. This also happens if guards are chasing you after you clear Commander Maro but before you enter the Castle Dour. ? To fix this, simply reload the last save. 5 It would appear all the contracts leading up to the Emperor's assassination have been completed. I must now speak with Astrid, and receive further instructions. 10 Using the Writ of Passage issued to the chef known as "The Gourmet," I must enter Castle Dour and play the part of the culinary master, who is scheduled to prepare a feast. This will be my opportunity to assassinate the Emperor, using any tools at my disposal. Objective 60: Escape the Tower! 70 It was a trap! The Emperor was actually Titus Mede II's double, and Commander Maro said I had been betrayed by someone within the Dark Brotherhood. Despite his deal, Maro has sent troops to destroy the Sanctuary. I must return there and help my Family! 200 Finishes quest After learning the Emperor was actually Titus Mede II's double, and being confronted by Commander Maro, I learned Maro had betrayed the betrayer, and sent troops to destroy the Dark Brotherhood Sanctuary. I returned there, to lend aid to my fellow Family members. The following empty quest stages were omitted from the table: 0, 75, 255. On the PC, it is possible to use the console to advance through the quest by entering setstage DB09 stage, where stage is the number of the stage you wish to complete. It is not possible to un-complete (i.e. go back) quest stages, but it is possible to clear all stages of the quest using resetquest DB09. This page was last modified on 3 September 2018, at 03:36.